STARZ has rescued canceled BBC Doctor Who spinoff Torchwood (get it?) and revamped it for American audiences. 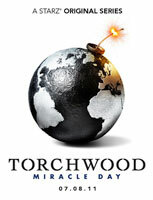 Eager sci-fi nuts can watch the first episode of Torchwood: Miracle Day in full for FREE at the Ritz East tomorrow (TUE 7/5) at 7:00 PM. Ticketing begins at 6:00 and there will be complimentary concessions…expect the place to be packed. And if you can’t make it out, the same episode will be broadcast and uploaded this Friday for your viewing pleasure.